It's a bit of a misnomer to call this album Live. I'm not suggesting listeners sue anyone for truth in advertising. 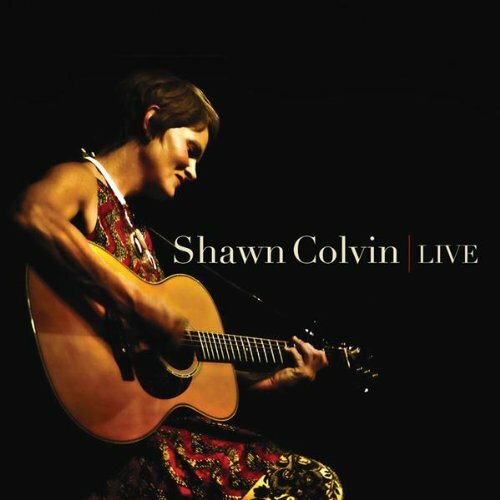 This is, in fact, a live album and if Shawn Colvin wants to follow in the footsteps of 100,000 other artists and name her live album Live, she's perfectly free to do that but it feels like there is something missing in the title that doesn't quite prepare listeners for the journey they're about to take. Live is at once something more and something less than a live album. Colvin performs songs from across her career and even mixes in an unexpected, oddball cover of Gnarls Barkley's "Crazy." We'll come back to that. What's surprising about Live is how much there is to strip away for a solo acoustic performance like this. Colvin's songs are far removed from contemporary pop constructions and arrangements but stripping those songs to just voice and acoustic guitar reveals there was more subtle craftsmanship than meets the eye. Even more revealing is just how great an interpreter Colvin is. They didn't need to be stripped this bare but Colvin's great vocal performance make it a worthwhile experiment. On the surface, this will sound like the kind of thing you'd listen to or buy at Starbucks and the coffeehouse crowd won't be disappointed. What elevates this above the endless spate of singer/songwriters is Colvin and her songs. This is not amateur hour. A lifetime of ups and downs inform these songs and there is an empathy in her voice that elevates her above the pack of pleasant sounding, well-meaning pretenders. Her breakthrough album A Few Small Repairs is well represented on Live. She gives a fine performance of the hit "Sunny Came Home." It wasn't the best song on Repairs despite its commercial success. It's not the best song on Live or the best song from Repairs on Live. "Trouble" and "Wichita Skyline"" are also presented and both shine. If Sony and Colvin can work it out (Colvin has since moved to Nonesuch), they should really get an acoustic live performance of the entire Repairs to release as part of a well-deserved deluxe edition. It's difficult — and pointless — to say any of these solo versions eclipse their studio predecessor. "I'm Gone," from These Four Walls, does but the rest are complementary. While nothing here is dramatically different, Live is a new way to appreciate these songs, some of which have been around for quite awhile. One that hasn't been around for a long time is "Crazy." I'll admit I found the Gnarls Barkley version an annoying trifle. While I'd just as soon she played "You and The Mona Lisa" or another track from one of her own albums, this cover of "Crazy" is pretty interesting. Beneath the beat-driven, hip hop production is an actual song. It all still feels a bit like a novelty to me. The sound is not impeccable and it feels like it should be. It's an acoustic guitar and a microphone. Surely in the 21st Century we can capture that and mix it without the presence of static or overdrive, yet some songs ("Diamonds In The Rough" is one example) suffer. It's a shame because in spite of the occasional less than stellar sound, this is still a worthwhile set. Live is that rare album that could serve as a good introduction to an artist while still pleasing longtime fans, each of whom will now wait anxiously for her next studio effort.